This is the hair from badgers that are found in remote high mountain regions of China. It is the finest silvertip hair with exceptionally soft tips. The remaining brushes in this batch have a 22mm knot with a 50mm loft with good backbone which makes it a great all round brush for face and bowl lathering. The ivory alternative handle is 45mm high with a diameter of 34mm. The price, including worldwide delivery, is £45. Order by sending £45 by paypal to nfbrushes@yahoo.com with a note of the brush required. A NEW HIGH MOUNTAIN BADGER BRUSH WILL BE RELEASED IN APRIL. Can you get this brush with a different handle? No. But if I make another batch, I will consider new shapes and material. Is there much difference between this brush and your #2213 brush? The fan shape with a shorter loft makes the size seem similar, the hair is slightly softer. Sorry to bother you, but I'd like to know what the shipping method is, please. The brush looks absolutely great! All international orders sent by UK Airmail, usually arrives within 3 to 5 days. To keep costs down I do not require signature or use a tracking service. It works well. Thanks Fido for this amazing little brush. After a couple of weeks use I just can't believe how soft and luxurious this brush is, with still the backbone to massage the cream into my face and all at half the price of my previous inferior(yet well known and marketed)brush. I am thankful to have found New Forest and hope you continue on with your little hobby here with great success. love the 2223 High Mountain Badger. Great brush, value and extremely quick servicce. "I have used my new brush over the weekend and wanted to say it is just fabulously soft and luxurious. Kept to the same shave routine of soap and face lathering so I was able to compare to the Tubby 1. It was a very different experience, but both equally enjoyable in there own way and can now fully appreciate why people have a rotation. In short absolutely thrilled with both the Tubby 1 and High Mountain Badger, so much so that I have decided to buy some more of your brushes over the next few months and try to compare them all, will be in touch soon to place my next order." Your New Forest 2223 High Mountain Badger looks so beautiful (you must hear that all the time). And the price is unbelievable (you must hear that a lot as well). I appreciate you putting forth all the effort to offer us such great brushes at such great prices. Those of us with rather small incomes (I'm a Special Ed. Teacher - I'll never be rich ;) ) benefit greatly from your work. Thank you. I prefer fan-shaped brushes - I figure if I'm going to pay extra for a really fine, soft knot of badger hair, I want as much of it touching my face, all at once, as possible ;-) So... Is your New Forest 2223 High Mountain Badger considered to be fan-shaped? It sort of looks like it, but it's hard for me to tell for sure. Especially before it has 'bloomed'. If not, can you suggest one of your brushes that has a fan-shape? Thanks for any help, and thanks again for the service you are providing to us in the wet-shaving community. I'm not sure when you posted your comment because blogger seem to have stopped notifying me about new posts. The 2223 is fan shaped - not quite as flat topped as some but it's certainly not bulb shaped. It so happens I now have only two left - both with a 50mm loft wich will give a larger face feel than the shorter loft versions I have been selling up to now. 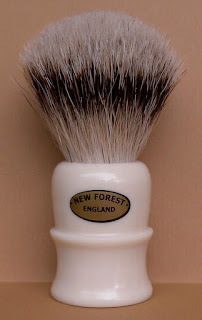 My only other fan shape brush is the New Forest 1901 which you will see listed below. Hi, In my opinion, the brush handle is too big. 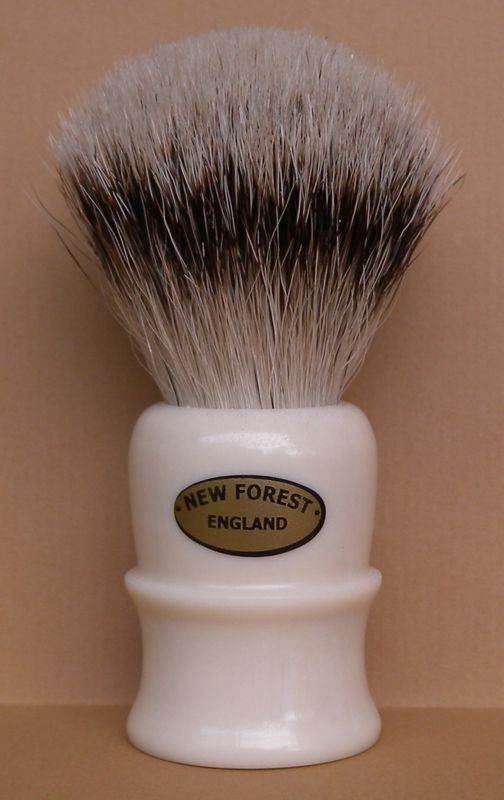 Is there any new forest brush that has a smaller grip? The New Forest 2001 has a smaller handle.